New: since 19 July 2017, the game is also available on Steam! 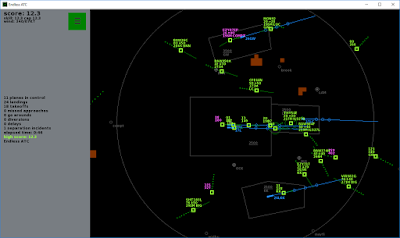 The simulator Endless ATC can be downloaded for PC on Steam or Itch.io, and for android in the Play Store. There are also a free versions available. Additional features include text-to-speech output, six airports, weather, manual handoff, areas with restrictions and adjustable radar update interval. Note: I only published the PC version to Steam and Itch.io, so please download it from there, not another site, to make sure you get the original version with updates.